Pretesting is the process of bringing together members of the priority audience to react to the components of a communication campaign before they are produced in final form. Pre-testing measures the reaction of the selected group of individuals and helps determine whether the priority audience will find the components - usually draft materials understandable, believable and appealing. Keep in mind that for social and behavior change communication (SBCC) campaigns and materials to be most effective, they should be tested at several stages of development. In the SBCC process, four types of testing are typically conducted: concept testing, stakeholder reviews, pretesting and field testing. The graphic below demonstrates the relationship between the four types of testing. This guide covers only pretesting. Pretesting increases the impact of SBCC materials by determining if what has been designed is suitable for the audience. It can save money, time and energy overall as the resulting material will be effective. Do not skip the pretesting phase. If there are not resources or time to conduct a large-scale pretest, even a small-scale pretest can offer useful insights if it is thoughtfully designed. A small focused team of key program staff (3-4 people) should develop the plans for pretesting. For the pretest to be most effective, however, it is best to find people most like the priority audience - who are trained in pretesting - to lead the actual pretesting exercises. Having someone who is like the audience will encourage honesty and openness during the pretesting process. Some organizations may consider hiring a research firm to conduct the pretesting. When Should Pretesting be Conducted? Pretesting should be completed after concept testing, message design, and materials development, and before components of the communication campaign are finalized, produced and disseminated. Completing pretesting typically takes between two weeks and two months depending on the testing method, the objectives of the pretest, the number of campaign elements to be tested, and the number of revisions necessary. If materials or messages require a complete rework, it could take longer. 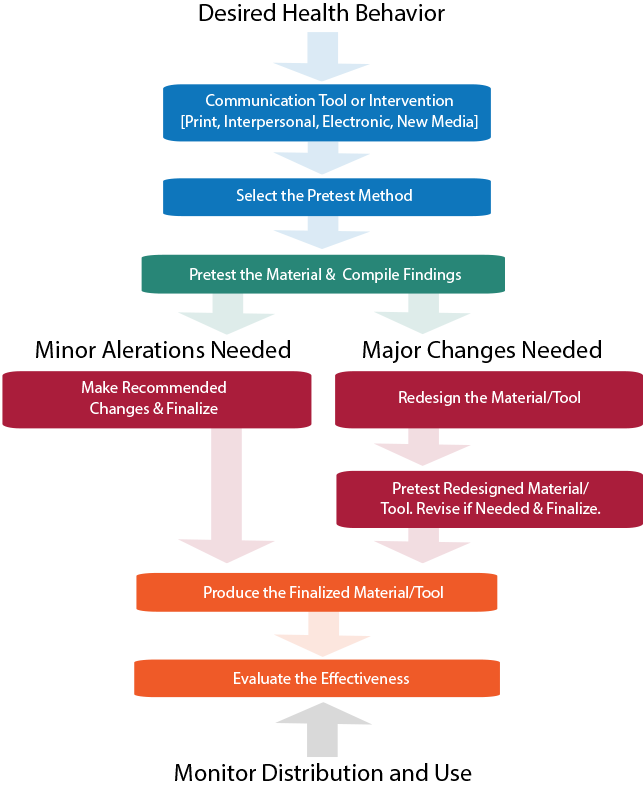 Understand the steps and the stages of testing SBCC materials. Define and list the elements of pretesting. Know how to choose a pretesting method. Know how to conduct a pretest. To guide the pretest process, the team should develop a plan with a clear set of objectives for each component or material being tested. The objectives describe the aims of the pretest and the information to be gathered. Start by reviewing the creative brief(s) for the SBCC campaign. The creative brief’s description of the priority audience, the promoted behavior and the key promise can be used to inform the pretest objectives. Review the table below for a list of pretesting methods. Keep in mind that using one method might limit the assessment. The use of mixed methods (e.g. survey questionnaire and in-depth interviews) is one way to capture additional information and fill gaps. Project teams should be able to articulate why they have chosen a certain method or methods for their pretest. Location:The priority audience should feel comfortable with the pretesting location. For example, it might be best to conduct the pretest in areas or places (e.g. clinics, churches) where the priority audience is most likely to encounter the materials. Facilitators/Interviewers/Note-takers: For focus group discussions and in-depth interviews, make sure to identify trained or experienced moderators or facilitators. Trained facilitators can be found at universities, research firms, or partner organizations. If possible, use a facilitator who has similar characteristics (e.g. age, background) to the priority audience. This helps to develop trust and comfort among the participants. It is also important to have a trained note-taker who is familiar with the topic and speaks the local language. 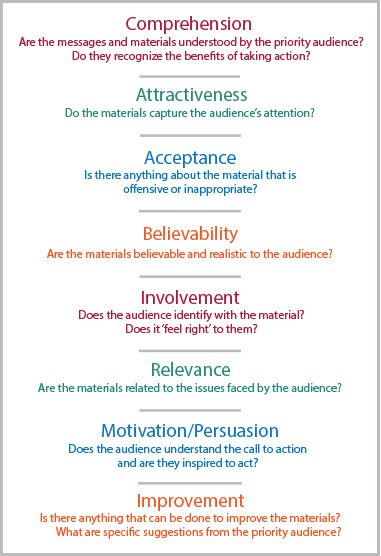 Participants: Use the creative brief to identify key characteristics of the priority audience. Select a sample of participants that match those characteristics to participate in the pretest. Participants should not have had any involvement in the development of your materials or concept testing. The sample size and collection method will depend on the selected pretest method (see Pretesting Methods Table in Step 2). It is often helpful to over-recruit participants in case some do not show up or complete the pretest. The image below provides some ideas on where to recruit participants. Some organizations have membership lists that can be used for recruitment. Cost: Create a budget to reflect costs for the meeting site, travel/accommodation, equipment rental, facilitator/moderator’s time, copies of draft materials, stakeholder meetings and incentives. Thoughtful budgeting can help ensure all pretesting costs are accounted for. The goal of pretest questions is to understand the value of the materials. For example, how effective are the posters in influencing young parents to practice birth spacing? A series of open-ended questions will gather specific details about the audience’s preferences. Avoid close-ended (yes or no) questions or those that lead participants to respond in a certain way. When developing questions, it is helpful to review the pretesting elements listed in the introduction. 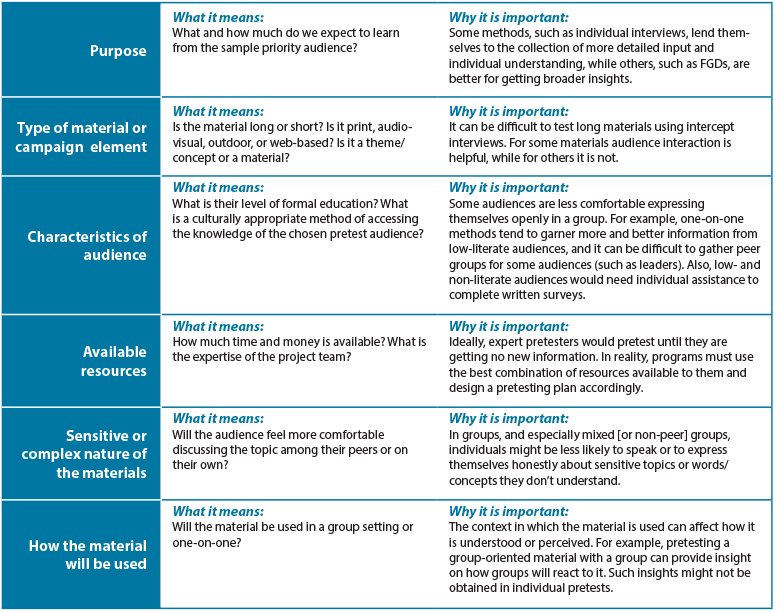 This will ensure questions are effective and meaningful (see example in table below). It is also important to include questions that will capture demographic information (e.g. age, education level, marital status, number of children) and details on how participants spend their day (e.g. media use, social gatherings). The program and creative teams should work together to contribute questions about behavior and design. Consent Forms: It is important to obtain participant consent (verbal or written) prior to the pretest. Consent forms are written agreements that show the individual has volunteered to participate in the activity. It also informs the participant of the risks involved (or clearly states there is no risk). Recording and Note-taking: Some pretests use a self-administered questionnaire. When this is not the case, use a pretest answer sheet to note verbal and nonverbal responses to the material. This promotes consistency among interviewers and pretest sessions. Include on the data sheet the date, time, place, name and type of material, audience, respondent number, element (e.g. image, text, font, audio/video segment, character), pretest questions, and other relevant information as appropriate. Pretests can be recorded to help remind or clarify, but recording should not take the place of note-taking (see Resources Section). The specifics on how to conduct a pretest will differ based on the method. The pretesting guide in the samples section outlines how to conduct a Focus Group Discussion (FGD) pretest. For details on how to conduct other types of pretests (see Resources Section). With any type of pretest methods, it is important to use open-ended and probing questions to obtain rich information and avoid unduly influencing respondents. Look for trends in responses. If a certain problem or change is mentioned multiple times, it is something that likely needs to be addressed. Determine whether results highlight fundamental flaws with the design, messages, or format. If so, the material may need to be completely redesigned. Otherwise, basic revisions should address the problems. Consult materials development experts about the suggested changes or problems highlighted. Do not feel compelled to make every change participants suggest. Background: What was tested? What were the pretest objectives? Which audience was involved in the process? Why? How? How many participants were involved in the pretest? Highlights: Summarize the main points that came up during the testing. Findings: Present a complete report on the findings. Where appropriate, describe the participants’ reactions, incorporate key quotes and describe which creative ideas and concepts worked the best versus those that were not appealing or effective. Conclusions: Describe the patterns that came up and/or the major differences that were observed across the individuals and/or groups. Recommendations: Suggest and prioritize revisions for the tested creative ideas, concepts, and/or materials based on the findings and conclusions. The results should be discussed among those involved with designing the messages, creating the materials and conducting the pretest. This includes program staff, designers, writers, editors, interviewers and note-takers (see Pretest Report Sample under samples). If the results of the pretest indicate that major revisions are needed, a complete redesign may be required. Once the materials have been revised, pretest the new version if budget and time allow. The same questionnaire or FGD guide can be used as before with questions added or changed as needed on the particular areas of concern. This is to make sure the problem from the first design is addressed in the newer version. Pretest some options and alternate concepts if possible, not only one version of a material. Even if you are pretesting a draft and not a final draft, the draft should be as close to the final version as possible so that those reviewing it can judge it appropriately. Be open-minded about the outcome of the pretest. If you have already decided what you will find, you will only hear that and miss important insights. Don’t use convenience sampling. The group of people most convenient for you to gather may not best represent your priority audience for the material. Check with the donor and local government to see whether IRB approval is needed prior to pretest. Pretesting is the key to understanding how a priority audience will react and respond to SBCC messages and materials. Pretesting can save money, time and energy overall as the resultant material will be most suitable for the priority audience and will not run the risk of being inappropriate, misunderstood or rejected. Concept testing seeks feedback about general ideas, concepts and creative concepts; typically done before materials are developed. Field testing allows practitioners to observe whether the SBCC materials are used effectively in their intended settings and contexts, usually through observation and focus group discussions. It determines whether the material meets the intended purpose. FOG Readability Test measures the readability of writing by estimating how many years of formal education are needed to understand a text. The fog index is calculated by selecting a passage of text, determining the average sentence length, counting words with three or more syllables, adding the average sentence length and percentage of complex words, and multiplying by "4". Incentives are small gifts of appreciation to participants. They might include cash, a snack (e.g. drink, tea, biscuits), phone credit, transport money or hygiene products (e.g. soap, toothbrush). Probing questions are follow-up questions that reiterate a participant’s comment and clarifies the comment while asking for further information. Some probes can be developed in advance. SMOG Readability Test is a measure of readability that estimates the years of education needed to understand a piece of writing. It is calculated by reading 30 sentences, counting words with more than 3 syllables, and using a formula. Stakeholders can include all those involved in or affected by the health or social issue, including public, private and NGO sector agencies, relevant Government Ministries, service delivery groups, audience members, advertising agencies, media and technical experts. Stakeholder reviews are input from technical experts, partners and decision-makers prior to finalizing materials. These reviews do not replace pretesting with the priority audience and can be done before or after pretesting. Brown, K., Linderger, J. & Bryant, C. (2008). 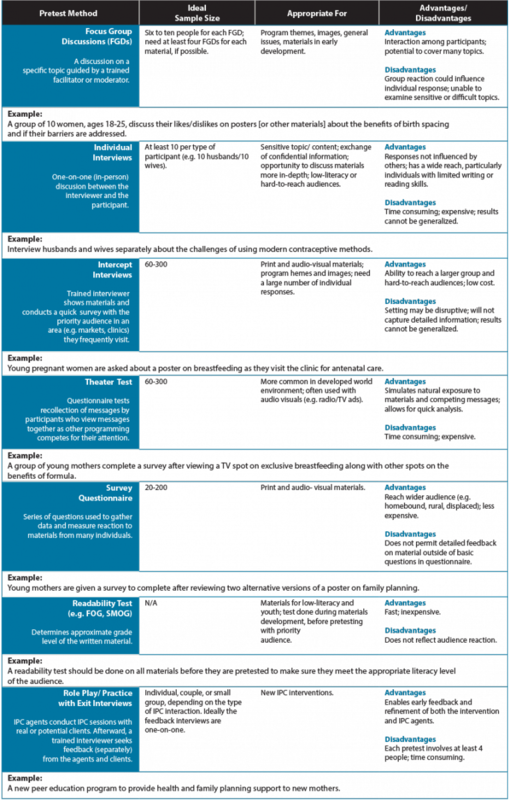 Using pretesting to ensure your messages and materials are on strategy [Electronic version]. Health Promotion Practice, 9 (2), 116-122. C-Change (Communication for Change) (2012). C-Bulletins: Developing and Adapting Materials for Audiences with Lower Literacy Skills. Washington, DC: FHI 360/C-Change. Escalada, M. (2007). Pretesting and evaluation of communication materials. Johns Hopkins Bloomberg School of Public Health. Fundamentals of program evaluation: Course 380.611. Communication pretesting, needs assessment (U.S.). Population Services International. Pretesting Toolkit. Population Services International. The effects of interview method on self-reported sexual behavior and perceptions of community norms in Botswana. 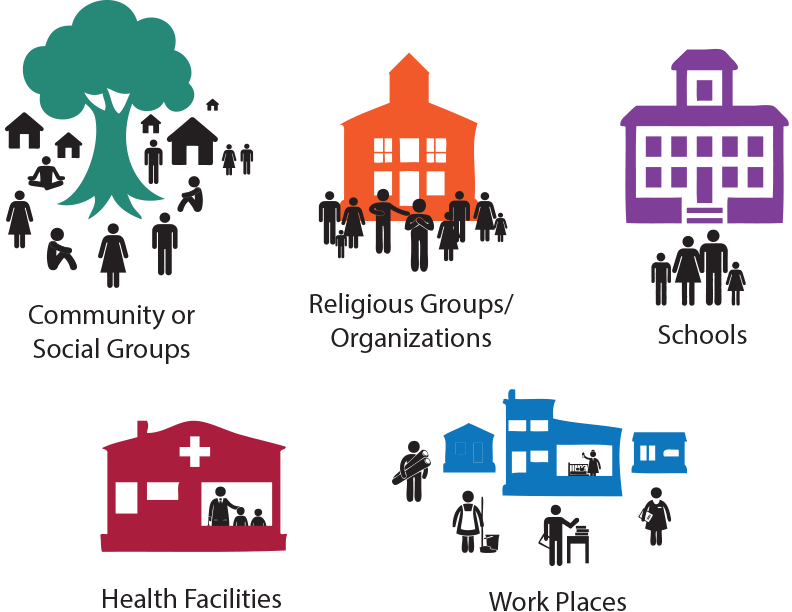 SBC How-to Guides are short guides that provide step-by-step instructions on how to perform core social and behavior change tasks. From formative research through monitoring and evaluation, these guides cover each step of the SBC process, offer useful hints, and include important resources and references.